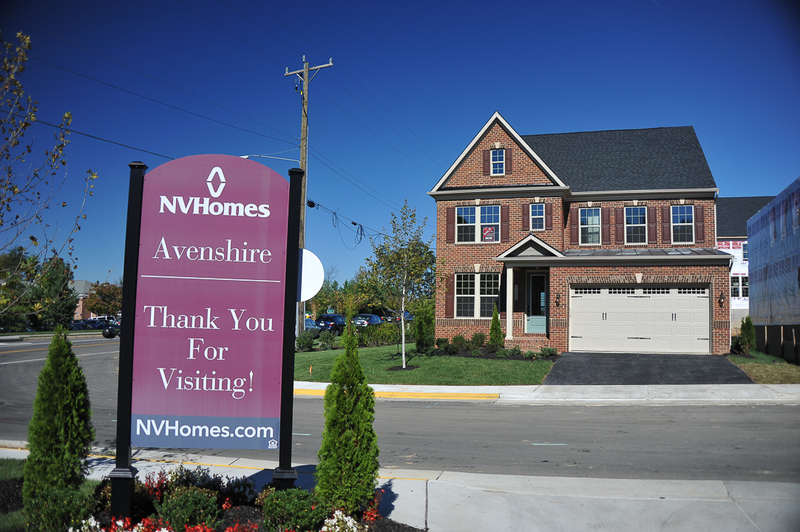 Built by NV Homes, Avenshire is located super-close to Wegmans and Fairfax Corner. There will be a total of 40 single family homes, with the community about 65% sold already. Prices for the Baldwin and Tyler models start in the upper $900s and buyers will have a variety of upgrades to choose from, including a covered rear porch like the photo below. The model’s beautifully appointed kitchen (exquisite subway tile backsplash, stainless steel appliances and premium cabinets) opens up to the comfortable family room with tons of windows and a cozy gas fireplace. A cool color palette, elegant crown molding and a luxurious bath can be found upstairs in the owners suite. Another available option is the upper level den. This versatile space could be used as a playroom, homework space, or simply a hang-out area for the family. The model does have a finished basement, and shows the idea of having a bar as well as entertaining spaces. Avenshire is well-located just minutes away from Wegmans and Fairfax Corner, so whether you are looking for groceries, or dinner, shopping and a movie, its all super-close. Commuter routes such as 66 and 50 are nearby and provide easy access to the DC Metro area. Are you thinking about moving to Fairfax? Call us at 703-822-0207 or e-mail us at tomandcindy@hellovirginia.com anytime–we would be happy to help you find your dream home. Whether you choose a new construction property, or a re-sale, we would walk you through the entire process, and be there to help with negotiating, inspections, walk-thrus and any issues that might arise. If you aren’t ready to talk yet, that’s totally fine. If you would like to be kept up-to-date on new construction projects, sign up for our monthly digital magazine, Headed Home. Each month we feature different new homes developments, along with our open houses, coming soon properties and news about the local area. Join us.